As the first woman to represent Wyoming in Congress, Barbara Cubin quickly established herself as a defender of western state interests in the House. Congresswoman Cubin also became one of the highest–ranking women in the GOP, serving as Secretary of the House Republican Conference and chairing the Committee on Resources’ Subcommittee on Energy and Mineral Resources. Barbara Sage was born in Salinas, California, on November 30, 1946, the daughter of Russell and Barbara Sage. She was raised in Casper, Wyoming, and graduated from Natrona County High School. In 1969, Sage earned a B.S. in chemistry from Creighton University in Omaha, Nebraska. She later took graduate courses in business administration at Casper College. She worked as a chemist, a substitute math and science teacher, and a social worker for the elderly and disabled. Barbara Sage married Frederick W. Cubin, a physician, and they raised two sons, William and Eric. From 1975 to 1994, while Barbara Cubin managed her husband’s medical practice, she also was active in the local parent teacher association and as a shelter volunteer. In 1986 she won election to the Wyoming house of representatives, where she chaired the joint interim economic development subcommittee. Cubin also served as the Natrona County chairman for Craig Thomas during his successful bid for Wyoming’s At–Large seat in the U.S. House of Representatives. In 1992, Cubin won a Wyoming senate seat, where she served on the revenue committee. 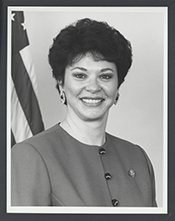 When she claimed her seat in the 104th Congress (1995–1997) in January 1995, Representative Cubin received assignments on the Resources and Science committees. In the 105th Congress (1997–1999), she resigned the Science Committee assignment for a spot on the Commerce Committee (now Energy and Commerce). On the Resources Committee, Cubin chaired the Energy and Mineral Resources Subcommittee from the 105th Congress through the 108th Congress (2003–2005). Cubin rose into the GOP leadership quickly, serving in her early terms as a Deputy Majority Whip. In the 107th Congress, she was elected Secretary of the Republican Conference, the sixth–ranking GOP leadership position in the House. During the race, she called for regional balance and a western state perspective in leadership circles. “I believe the views of a Member from a Mountain West public lands state have too long been absent from the leadership table,” she explained. “Achieving a better working relationship through issue education with Members who don’t have to deal with an absent landlord is important to me and to the well–being of our conference.”7 Cubin also joined the Steering Committee, which parcels out committee assignments. She served as a Deputy GOP Whip in the 110th Congress (2007–2009). In November 2007, Representative Cubin announced her decision not to run for re–election to the House in 2008.8 Her term expired at the conclusion of the 110th Congress on January 3, 2009. 1“Election Statistics, 1920 to Present,” http://clerk.house.gov/member_info/electionInfo/index.aspx; Politics in America, 2008 (Washington, D.C.: Congressional Quarterly Inc., 2007): 1125–1126. 2Joel Achenbach, “See You in September: The GOP Freshmen Had a Giddy First Semester, but the Grading Gets Tougher When They Return,” 14 August 1995, Washington Post: D1. 3Charles Davant, “Away from Spotlight, Wyoming Congresswoman Prepares for Business,” 8 January 1999, States News Service. 4Chris George, “Cubin Favors Seeking New Energy Sources, Drilling in Arctic Lands,” 15 August 2000, Wyoming Tribune–Eagle: A6. 5“House Expresses Dismay at Murder of Gay Student in Wyoming,” 16 October 1998, Washington Post: A24. 6Politics in America, 2002 (Washington, D.C.: Congressional Quarterly Inc., 2001): 1121–1122. 7John Bresnahan, “Cubin Launches Leadership Bid; Wyo. Member Joins Conference Secretary Race,”: 3 July 2000, Roll Call. 8Bill McCarthy, “Cubin to Retire, Officials Say,” 10 November 2007, Wyoming Tribune–Eagle (Cheyenne): A1; David M. Drucker, “Crowded Race Likely for Cubin’s Seat,” 15 November 2007, Roll Call. Papers: 1993-2008, 63.1 cubic feet. The papers contain correspondence, subject files, legislative record books, poll books, speeches and press releases, meeting notes, and audio and video files relating to Barbara Cubin's time in political office. Topics within subject files include labor, abandoned mines, health, and transportation. "Barbara Cubin" in Profiles in Character: The Values that Made America. Nashville: Thomas Nelson Publishers, 1996. "Barbara L. Cubin" in Women in Congress, 1917-2006. Prepared under the direction of the Committee on House Administration by the Office of History & Preservation, U. S. House of Representatives. Washington: Government Printing Office, 2006.